Amrosa in Staithes, near Whitby sleeps 8 people. 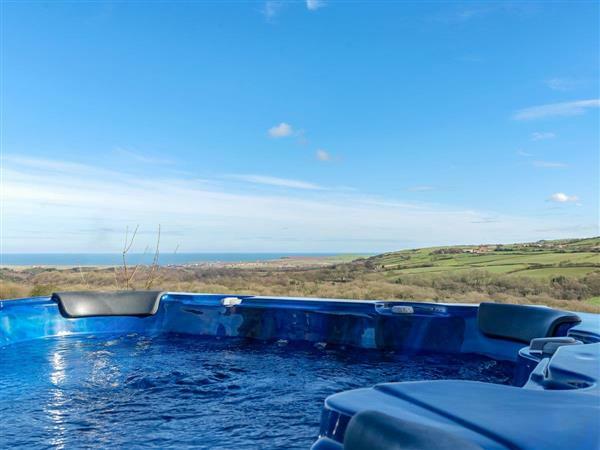 Amrosa near Whitby is a luxurious property which is set on the edge of the North York Moors National Park and overlooking the fishing village of Staithes on the beautiful North Yorkshire Coast. Amrosa near Whitby is a fabulous base for exploring the hidden delights that Yorkshire has to offer, or simply unwinding in these beautiful surroundings. There is plenty of space to relax and make the most of all the home comforts and for the ultimate chill, there is a hot tub nest to the decking which has the most amazing views, taking in the sea, the quaint fishing village of Staithes and the surrounding beautiful countryside of the North Yorkshire Moors. From smugglers coves along the Yorkshire Heritage Coast to the hustle and bustle in the famous fishing town of Whitby. The unspoilt fishing village of Staithes, just 3 miles away, nestles into the cliffs of the Heritage Coast and is just one of the nearby hidden beaches to explore. Other hidden gems include Runswick Bay, Saltburn-by-the-sea and Robin Hood’s Bay, each has its own story of pirates and smuggling to tell. The medieval walled city of York is just an hour away and is well worth a visit. After a day of exploring there is no better way to relax than a dip in the hot tub with its 144 jets, LED lights and speaker system, or a drink on the raised terrace over-looking a beautiful, tranquil garden area. Amrosa near Whitby benefits from a fabulous wood burner which is perfect for relaxing in front of, after a day out exploring the area, and there is even a mini bar in the living area. Amrosa is perfectly equipped with everything you could possibly need for a stay in this wonderful part of the world to enjoy a truly memorable holiday. The beach and shop are 3 miles, with the pub 1 mile and restaurant ½ mile from Amrosa near Whitby. Amrosa near Whitby has 6 steps to entrance. Living/dining room: With wood burner, 42 BT Vision TV (sports package), Blu-ray player, CD player, Playstation 3 with a selection of games, beams, wooden floor and bi-fold doors leading to decking. Kitchen/dining room: With breakfast area, 2 electric cookers, induction hob, combi microwave/oven/grill, American style fridge/freezer, dishwasher, coffee machine, washing machine, 32 Freeview TV and tiled floor. Bedroom 1: With king-size bed, Freeview TV and en-suite with roll top bath, double shower cubicle, double basins and heated towel rail. Bedroom 4: With twin beds, Freeview TV and en-suite with shower cubicle, toilet and heated towel rail. Air source underfloor central heating, bed linen, towels and Wi-Fi included. Initial logs for wood burner included. Welcome pack. Large enclosed lawned garden with decked area, garden furniture and barbecue. Hot tub for 7 (private). Private parking for 2 cars. No smoking. Please note: No children under 5 years old. Holidays at Amrosa run from Friday to Friday. For a better idea of where Amrosa is, you can see Amrosa on the map below. You can find more large holiday cottages (that's cottages which sleep 8 or more people) in Cleveland. If you want to see more large cottages, have a look at large cottages in Cleveland. Amrosa is in Cleveland; should you be on the lookout for a special offer, you can find all the special offers in Cleveland. It's always worth checking to see what is on offer at the moment. Do you want to holiday near Amrosa (UKC1234), you can see other cottages within 25 miles of Amrosa; have a look to find your perfect holiday location.